I enjoy reading mysteries, and it was fun to find one that is suitable for younger readers. After a summer of vacations and erratic schedules, this is a good one for easing back into reading. A rare species of white giraffe, worshipped by the Masai tribe, has disappeared from the savannah. So Agatha and her cousin Dash head to Africa on their next adventure to help solve the mystery. There, they join forces with a third cousin--a safari expert--to track down the poacher who has stolen the priceless animal. 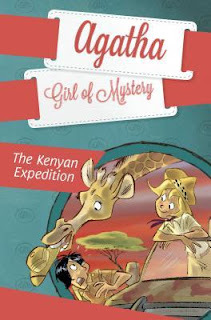 Agatha, Girl of Mystery: The Kenyan Expedition by Sir Steve Stevenson, illustrated by Stefano Turconi, Grosset & Dunlop, 2015. This is a fun, straightforward mystery for kids who are just starting to become interested in reading mysteries and finding clues. I’ve never read any of this series before, but I liked the detective team of Agatha and her cousin Dash, and their sidekicks Agatha’s butler Chandler and the cat, Watson. Readers who are new to this series might be a bit surprised when the first chapter is about Dash, since Agatha is in the title. This one has the threat of danger and a time pressure to find the giraffe, which keeps the story moving. As a writer, what I admired about this book was the liveliness and energy. I can see why it would be popular with young readers. The illustrator, Stefano Turconi, lives in Italy. If you like this one, there are many other books in the Agatha, Girl of Mystery series. For more middle grade book recommendations, visit Marvelous Middle Grade Monday on Shannon Messenger's blog! The setting makes this sound interesting right away. Sounds like a great series for newer middle graders. Perfect selection as I have been looking for a books of this type for new and reluctant readers. So many intriguing aspects in this series. Perfect selection as I have been looking for books that new middle grade readers might enjoy. So many great aspects to this series. Thanks for featuring. Imagine having a butler as your sidekick. Cool! Illustrated books are great for readers just getting into middle grade. It is hard to find mysteries for this age. Thanks for the review.